The British PM visits St.Mary's Primary School for its 6th Green Flag celebrations! On 12 October, St.Mary’s Primary School had a visit from the local Member of Parliament, the Rt. Hon. Theresa May, Prime Minister. 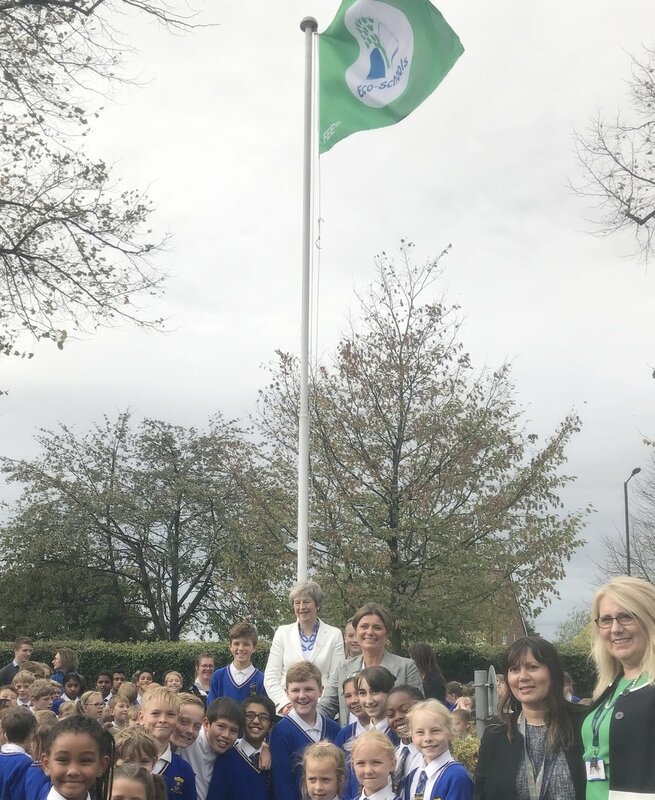 The school celebrated receiving its sixth Green Flag in a special assembly, led by Eco Leader Mrs Hurrell, before heading out to the newly refurbished eco-garden for an official opening. The Eco Committee stated that the Prime Minister was very impressed with how the whole school had been involved with the planting. They then moved to the flag pole at the front of the school where the Prime Minister raised the school’s sixth Green Flag. The Green Flag is a symbol of sustainable living. The Eco-Schools assessors stated the following: “We truly felt that St. Mary’s Primary School embodies all elements of what it means to be an Eco-School. The students are enthusiastic, keen and understand what it means to care for the environment and their energy is infectious. Mrs Hurrell has done a phenomenal job in championing the cause and she is an inspiration to the children. They have embedded environment into their curriculum seamlessly and are an inspiration to all schools.” The Eco Committee reported that the Prime Minister mentioned that the school was an inspiration to all others. Guests joined from the Portsmouth Diocese, Cafod, the Climate Coalition and Keep Britain Tidy, as well as Mrs Vanderpool from Anguilla who officially accepted the cheque of £4000 from the school for all the fund raising undertaken by the children to help rebuild the Vanderpool Primary School following the devastation of Hurricane Irma. Older PostEco-Schools Romania celebrates 20 years of Eco-Schools!